The time has come for your organization to upgrade its software systems. This may mean adopting an enterprise resource planning (ERP) system for the first time, or upgrading your ERP system to better suit the ever-changing needs of your business. You pore over feature lists, negotiate nice-to-have and critical functionalities, and judge the ease and user experience of software interfaces. It’s a long process, fraught with impersonal sales calls and never-ending email threads. The VSO for ERP was created to provide a neutral environment for businesses to learn best practices on software selection and implementation, and to evaluate top ERP systems according to their needs—without sales pressure. Attendees talk to multiple ERP software vendors directly and compare their solutions during live demos, using a script prepared by TEC’s selection experts. It’s the simplest, most efficient way to research ERP solutions and make a smarter, more informed decision that will save you time, money, and frustration during the implementation process. 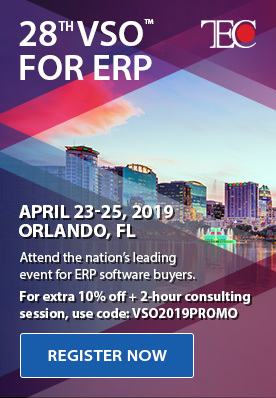 The VSO for ERP is the longest-running enterprise software evaluation, comparison, and selection event, hosting its 28th edition April 23 to 25, in Orlando, Florida. Feature lists are a great starting point. However, it’s also important to understand not only what features an ERP system supports, but how it enables your users to achieve their tasks at hand. During the VSO, vendors demo their software based on a script put together by TEC’s selection experts, so you can compare solutions on an equal playing field. Breakout sessions with vendors give you a chance to ask your business-critical questions to the vendors face-to-face, while industry segments share bleeding-edge best practice recommendations that your business can’t afford to miss. Vendors typically showcase their strengths—and maybe gloss over their weaknesses. Our mission at TEC is to help companies evaluate and select the best software solution for their business needs; we do this by reviewing multiple vendor offerings as objectively as possible. We’ve been doing this for 25 years, and we’re happy to be moderating the VSO event so we can share the winning strategies we’ve developed over the years. You’ll also learn about our decision support software—the foundation of our data-driven, best practices approach that lets you visualize and score every aspect of your software evaluation, which helps our customers make a smarter, well-researched, and well-reasoned ERP selection. In addition to meeting with vendors and TEC specialists, you’ll also have the opportunity to network with other attendees and share lessons from past experiences (or nightmares!) with ERP software evaluation and selection. Furthermore, representatives from the organizing team will share their customers’ stories on ERP implementation projects and provide tips on how to run an implementation project smoothly while avoiding costly mistakes. The post Making the Leap to ERP? This Event Will Save You Time and Money (VSO for ERP 2019) appeared first on erpinnews.